Creatio Universi... [Genesis] - Fuesslinus, T.M. Title : Creatio Universi... [Genesis]. Map maker : Fuesslinus, T.M.. Size : 12.8 x 16.0 inches. / 32.4 x 40.6 cm. 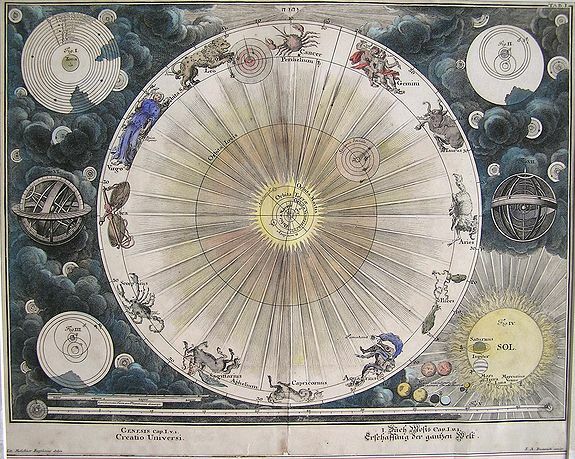 Description :An attractive and skillful engraving of the creation of the universe, the earth surrounded by planetary orbits, by Tigur Melchior Fuesslinus who flourished as an engraver in Augsburg in the first decade of the eighteenth century. Each of the twelve signs of the Zodiac is depicted around the central sphere, beyond which planetary diagrams and systems appear in the cloud-filled surround. Condition : Very good. Laid down on paper backing, small chip to bottom margin well away from image, mild age toning, strong impression. Approx 12 3/4 x 16 inches. Uncommon.